The United States Congress designated the Never Summer Wilderness (map) in 1980 and it now has a total of 20,847 acres. All of this wilderness is located in Colorado and is managed by the Forest Service. The Never Summer Wilderness is bordered by the Rocky Mountain National Park Wilderness to the east. As its name suggests, Never Summer Wilderness gets hit with large amounts of rain and snow that collect on its storm-wracked peaks, which offer relatively gentle terrain and bear names that hint at their cloud-kissed heights: Cirrus, Cumulus, Stratus, and Nimbus. 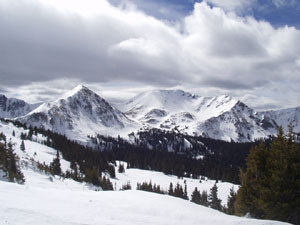 Seventeen summits rise above 12,000 feet, with Howard Mountain towering over all at 12,810 feet. Never Summer supplies water to three main rivers: the Colorado, the North Platte, and the Cache la Poudre. In damp gulches above 10,000 feet trees absorb the abundant moisture and grow old and exceptionally large. Spruce and fir in Bowen Gulch have been measured at four feet in diameter and estimated at 600 years in age, and the Bowen Gulch Trail will take you about five miles into the oldest of the old growth. In the northern section, a series of ponds and bogs provide rare habitats for species seldom seen so far from north-country muskegs: wood frogs, bog bean, pygmy shrew, perhaps even a wolverine or two. Moose have been reintroduced and are faring well. Several lakes and streams shelter trout. Straddling the Continental Divide, Never Summer has about 20 miles of trails that lead up gulches and cross the divide on two high passes. Planning to Visit the Never Summer Wilderness? How to follow the seven standard Leave No Trace principles differs in different parts of the country (desert vs. Rocky Mountains). Click on any of the principles listed below to learn more about how they apply in the Never Summer Wilderness.